Squats alone probably won't make your arms bigger. Squats and deadlifts are ideal for lower-body workouts because they activate your quads, hamstrings, calves and hips. In addition, deadlifts require lifting a barbell, which works your arms, shoulders and back, too. With modifications, squats can also work your arms. However, neither squats nor deadlifts are likely enough to create significant gains in your arm size. Add them to a well-rounded workout for the best benefits. 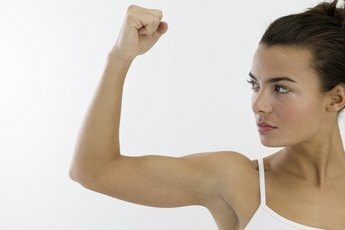 The muscles in your arms include the triceps, biceps and forearms. Working these muscles to fatigue on a regular basis is what creates gains in mass. This means a couple of deadlifts now and then aren't going to do much for you. Including squats and deadlifts in your regular routine, however, does challenge your arms in new ways, which is beneficial for keeping your progress on track. 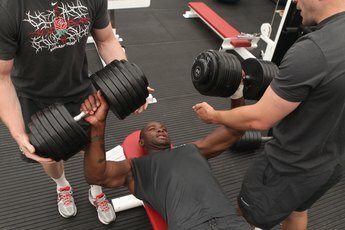 Mixing them with biceps curls, triceps dips and pullups engages all of your arm muscles and works to make them bigger. To do a deadlift, stand with your feet together with a barbell at your feet. Bend your knees and lower your body toward the ground. Grasp the barbell with both hands and slowly stand back up. You'll feel the muscles in your buttocks and legs working, but pulling the barbell upward as you stand also activates your arm muscles. Grip the barbell firmly with both hands and squeeze tightly as you stand up. This makes your arm muscles work harder, increasing the benefit. When choosing a barbell, make sure you can complete at least one set of 12 repetitions with good form. If you can't, your barbell is probably too heavy. If it's too easy, you need a heavier barbell. A traditional body-weight squat isn't going to do much for your arms. However, holding dumbbells in each hand increases the workload, offering benefits to your biceps and triceps. To do the move, stand with your feet about hip-width apart, arms at your sides and a dumbbell in each hand. Slowly lower your body as if sitting into a chair. Stop when your knees reach a 90-degree angle. Return to the starting position to finish one repetition. Holding the dumbbells during squats increases your overall body weight, making your lower half work harder, but also allowing you to work your arms. An alternative is to do squats while holding a barbell behind your neck and on your shoulders. It's best not to rely on a couple of moves for building arm strength. Yes, squats and deadlifts are good options for working several muscle groups at one time, but to really see a muscle mass gain in your arms, you can't use them alone. 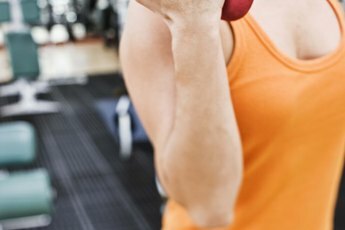 MayoClinic.com suggests doing at least 12 repetitions of each strength-training move in your routine, two or three times each week. Choose several that work your arms and combine them with deadlifts and squats. In just a few weeks, your arms will be tank-top ready. Do Kettlebells Melt Arm Fat?